The newest gridiron contenders in the valley took the field for the first time in the fall of 1928. Led by Coach James Robinson, a former coach at St. Mary’s High School in Portland, Oregon, the Brophy team was destined to be great. The headline in the sports section of The Arizona Republican on August 23, 1928 stated, “Rockne Football System Will Be Used at Brophy College”. This was written because supposedly Coach Robinson had played at Gonzaga under Gus Dorias, a teammate of Knute Rockne. With the luck-o-the Irish in the favor of the fledging Brophy team the inaugural season posted an overall 6-3 record, winning the final two in back to back games on Thanksgiving Day, November 29, 1928. 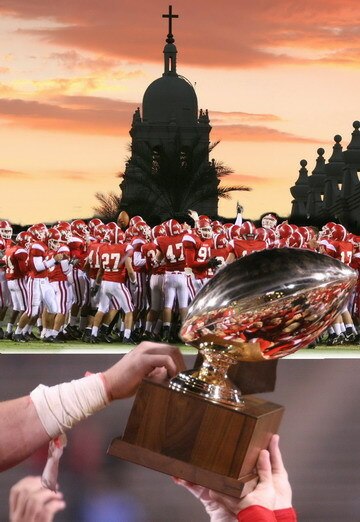 Brophy tradition claims that the Pintos were co-state champions that year. The Arizona Republican announced the possibility of a football game between Brophy and Phoenix High for December 8. This game never occurred because Coach Robinson of Brophy and Coach Robinson of Phoenix High refused to play each other. In those earliest days the team went through a series of nicknames. This can become a little confusing so beware. The Pintos was the first official nickname in 1928 but the following year Brophy also fielded a college team. The college team took over as the Pintos and the high school team became the Colts. 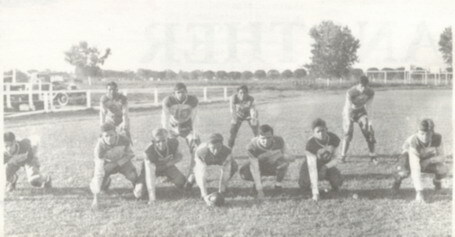 Throughout the 1929 season the high school team was also referred to by many in the valley and in the newspapers as the Pinto-Colts, the Preps, and even the Irish (the last nickname due mainly to the number of players with Irish last names). By the start of the 1930 season the college team adopted a new nickname that had a lasting effect, the Broncos. The original high school nickname was restored to the Pintos. Through all these changes in the early years two things remained constant; the Brophy teams were always one to contend with, and the team colors were always GREEN and WHITE. It did not take long for the newest team in the valley to gather a following of loyal fans. The local papers always had room to honor the Brophy teams and rivalries were born. The biggest rivals in these early years were Phoenix and Mesa. Prior to the start of the first season The Arizona Republican wrote about there being two Coach Robinsons, one at Brophy and the other at Phoenix. It went on to say, “He (Jim Robinson) will be somewhat of a thorn in the side of Ralph (Robinson) before many seasons elapse.” As far as the early rivalry with Mesa, “There are always two games on the Mesa schedule, winning either of which means a successful season.” (The Arizona Republic, November 27, 1930) The two teams being referred to were the Phoenix Coyotes and the Brophy Pintos. The achievement of the early Brophy teams can be attributed to players like backs Pat Lowry, Herb Bryant, Jack Halloran, Whitey Simpson, Harold Provo, Al Moore, Shelby Pohle; ends Merle Gowey; lineman Jack Tribolet, Bob and Bill Farrell, Harry Grabe, Paul Mehren, Jim Reardon. The success of the football program was moving steadily forward, while the success of the school and the national economy was dwindling. The Great Depression was taking its toll on the fledgling Jesuit High School, but not without a true gridiron fight. In an attempt to save the school financially, a benefit football game between the Loyal University Lions (LMU) and the Arizona State Teacher College Bulldogs (ASU) was scheduled in the spring of 1934. The Mesa High School Jackrabbits also agreed to play a preliminary game against the Pintos prior to the main event. Brophy President Fr. O’Keeffe, S.J, touted it the “Big Game” stating that it “should be a financial success.” Both games ended in victory for the Jesuit schools, with the Lions routing the Bulldogs 24 – 0 and the Pintos handling the Jackrabbits 12 – 0. Even though victory was accomplished on the field, the “Big Game” did not prove to be a financial jackpot. Even though the early years were financially tough on the school as a whole, under the guidance of Coach Robinson football flourished. Winning seasons were accomplished each year under his superb guidance. The 1934-35 slogan for the football season was, “Every man out for the team, either as a player, manager, or rooter.” In the September 2, 1934 issue of the The Arizona Republic it stated, “Sixty-five percent of the student body will turn out for one of the three teams.” The 134-35 season posted a respectable 5-2 record, however, on August 22, 1935 it was announced that the school would close indefinitely. The will of God at that time was to forever let go of the Pinto nickname and the green and white colors. The end result has been a rivalry and numerous battles on the gridiron over the decades to come. In 1952, like the Phoenix bird, Brophy rose from its ashes. In doing so it donned the colors of red and white. With the new colors came a new name, one that had previously been used by the 1930 Brophy College Team, the Broncos. Fr. James J. Devlin S.J. was Athletic Director and Coach for Brophy. Many decision were made that first year the school reopened. It was decided that there would be no varsity football due to the school admitting only a freshmen class. There was also a lack of equipment, so the school settled on basketball, baseball, and track for their first year. Devlin had a final decision to make; what would the nickname and colors of the school be? Many names were supposedly suggested, but in the end Devlin chose the Broncos and red and white. 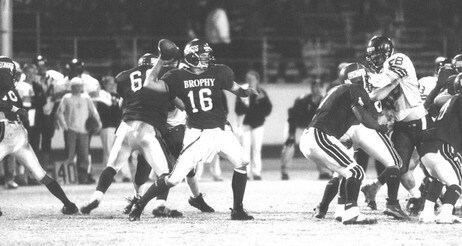 Another Brophy tradition has it that the nickname and colors were chosen because old equipment from Santa Clara University (whose nickname were the Broncos and colors were red and white) would be used at Brophy. Once the nickname and colors were in place, Brophy could now compete with the “Big Boys” of Arizona again, or so they thought. In 1953, Brophy and St. Mary’s both applied for full membership in the Arizona Interscholastic Association (AIA); both were rejected. Some loyal to Brophy Athletics, and football in particular, felt that this was unfair, after all, Brophy was “among the ruling class in Valley prep ranks when they departed from the football scene in 1935” (Phoenix Gazette, 1953). It was not until 1958, that Brophy was officially accepted by the AIA. This AIA recognition allowed Brophy, for the first time, to be eligible for state tournaments and state awards and honors that come as a result of being a member. The first varsity football season after reopening in 1952 was the 1954-55 school year. The coach that year was Rev. Gene Schallert, S.J. and the Bronco gridders had a rough time. The season ended in with a 2 – 8 record. Even though the season was tough, the Bronco spirit was back, and the hope of a strong and lasting football future was born. The start of the 1955-56 school year brought a new varsity football coach to Brophy. This coach, the second to be admitted to the Brophy Hall of Fame in 2001, was Ed Novak. Under the guidance of coach Novak the Broncos utilized the Split T formation. The first two seasons for coach Novak were a struggle, but the spirit of Bronco Football was gaining momentum. By Novak’s third year at the helm the Broncos had a winning season and continued this trend until the end of the decade, racking up an impressive 25 – 13 – 3 record. The 1959-60 season resulted in an 8-1 record and the Broncos wining the Class A North Conference Championship with a perfect 5-0 conference record. The team also touted three All-State players in Offensive Tackle Pat Long, Half-Back John Corbett, and Full-Back John Woodall. The decade of the 60’s showed the continued emergence of Bronco football. It also witnessed four head coaches in ten years. As any storied high school football program can tell you, the longevity of a head coach usually results in a legacy of great players as well as a successful program. If a program is constantly changing coaches, and with it the style of play, you have a tendency to have mediocre teams at best. Brophy overcame this adversity during the 60’s to post six winning seasons and claim the Co-championship of the 2AA Conference in 1964. The start of the decade saw the end of an era at Brophy with coach Novak leaving after the 1960 season. He was followed by Pete Pisciotta in 1961. The new coach struggled in his inaugural season stating “We’ve been just like a bridesmaid, always close but never there.” (Arizona Republic 1961) There was a glimmer of hope for the future of the Bronco football program in 1961. The upset of the number one ranked St. Mary’s Knights by a score of 14-6 was considered by coach Pisciotta as “the biggest thing in my athletic life.” (Arizona Republic 1961) The following year the Broncos improved their record to 7-3 and narrowly missed the playoffs with a loss to Sunnyslope. The team produced two All-State players that year in quarterback Tim Flood and split end Tim De Wan. By 1964 coach Pisciotta had a well conditioned team that was in a position to go to the playoffs. A three-way tie in the 2AA Conference with Flagstaff High and Glendale High resulted in a coin flip that eliminated Brophy’s post season hopes. Two years later would be coach Pisciotta’s last at Brophy, ending his stint as head coach with 5 winning seasons. Assisting Coach Pisciotta at various times during his tenure was Line Coach Mickey Ryan. Coach Fred Aldrich took the reigns of the Broncos only for the 1967 and 1968 seasons, assisted by Coach Ryan and newcomer Backs Coach Dan Whitehead. In 1967 Brophy officially moved into League 1 2AA, known as the Skyline Conference, for the first time. They also played their cross-canal rivals, the Central Bobcats for the first time. After a rocky first year Coach Aldrich led the team to a 7-3 record in 1968. That year All-State Linebacker Steve Braglia was one of the reasons for the Bronco defense being referred to statewide as the “Green Machine”. The final coaching change of the 60’s saw the emergence of Coach Trevor Stinson and his staff of Coach Ryan and Backs Coach John Chambers. Just like his predecessors during the 60’s, Stinson had a rough first year. Brophy excelled everywhere except on the scoreboard at the end of most games. The end of the 60’s was considered a rebuilding year and was just the beginning though for what lie ahead. During the 1970’s, the reign of Coach Stinson would compile nine winning seasons, one undefeated regular season, three Skyline A Conference Championships, two Skyline Division Championships, two state semi-final appearances and one final appearance. Bronco football was dominated by Defense during these years with five players being named to the First Team All-State Defense. Numerous times during the early 70’s the Broncos shut out their opponents. Part of the reason for opponents’ lack of scoring was due to All-State Defensive Linemen Chuck Stevens. The 1971 team had a stingy defense when it came to giving up points. In a four game winning streak during the 1971 football season the defense only gave up 13 points. This occurred as a result of a new team slogan, “We Care”, which was incorporated after a tough early season loss to St. Mary’s. The slogan was meant to show that the team care about and for each other as well as winning. The slogan worked and the team finished the regular season 8-2, the best regular season record in school history. They clinched their first Skyline A Conference Championship of the 70’s and their first trip to the post season. The Broncos continued on to the Skyline Division Championship game against Cortez High, avenging one of its regular season losses by beating the Colts 24 – 10 and adding Skyline Division Champs to their season accomplishments. The best season in school history came to an end against Tempe High the following week, but one could not overlook the numerous achievements the 1971 team made. Even St. Mary’s Head Coach Pat Lavin commented on the ’71 Broncos saying, “This is probably the best Brophy team ever fielded in the history of the school. They’re the biggest, quickest, and strongest and execute their plays well.”(Arizona Republic September 22, 1971). The Broncos, with the fresh taste of post season play still lingering, began to prepare for and even more memorable season. One need not ask what else there was to accomplish for Bronco Football at the start of the 1972 season. The team had unfinished business, both with St. Mary’s and in post season play. The ’72 team continued their defensive dominance by holding regular season opponents to only 79 points. Offense would play a key role for the team this year as well. The offense averaged 250 yards rushing and featured a tandem backfield with John Likovich (“Mr. Inside”) and Ron Steffen (“Mr. Outside”), both of whom gained over 1000 yards for the season. John Likovich was also named All-State Full Back. Not to be outdone by his twin brother, the defense had All-State Defensive Linemen Tom Likovich. The ’72 team repeated as both conference and division champs, making their first appearance in the state finals against the Central Bobcats. A new rivalry, one that had been slowly emerging since Central High School opened, really took off after the Bobcats beat the Broncos twice in one year. The season ended with a record breaking 10-3 mark for the Broncos, as well as victory over St. Mary’s. The next five season the Broncos maintained winning records, but Skyline titles and post season play always seemed to slip through their grasp. Defense was still formidable, producing 1973 All-State Defensive Lineman George Fadok (who went on to play under Frank Kush at ASU) and All-State Defensive Back Kelly Blake. Coach Stinson remarked that “Kelly Blake is the best all-around player we’ve had in my five years at Brophy.” (Phoenix Gazette October 10, 1073) Of all the great defensive players that Brophy produced during these five years there was one that slipped past the All-State accolades and went on to have a great career at both Arizona State University and with the Pittsburg Steelers. 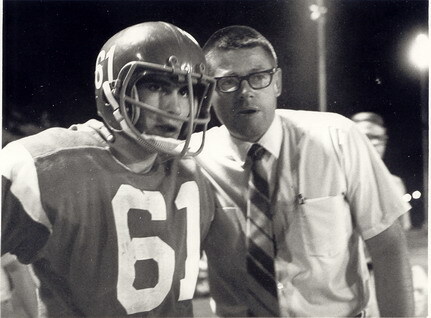 Bob Khors, during the 1975 season, was considered by Coach Stinson as the best Defensive End ever for Brophy. The 1978 Broncos were a small, undersized yet determined group. “Pygmy Power” was a term used by many when referring to the ’78 team. With each game looking to be an uphill battle due opponents being larger and stronger, the team took it one game at a time. Before they knew it they had finished the regular season undefeated with a 10-0 record and its third Skyline A Conference Crown. The Skyline Division Championship game would match the Broncos against parochial rival St. Mary’s. This would be the first time that this rivalry would play football against each other twice in the same season. Coach Stinson, when asked about playing against St. Mary’s stated, “I get worried every time we play them. I can’t eat or sleep, and besides that I break out in a rash.” (Phoenix Gazette November 17, 1978). “Pygmy Power” prevailed a second time against the Knights and the team soon found themselves in the state semi-finals. The perfect season ended with a loss to the Mt. View Toros in that game, but what a ride it was. Coach Stinson was named the Phoenix Gazette Coach of the Year for 1978, and even the Mt. View coach, legendary Jesse Parker, agreed with this choice. The final year of the 70’s would be considered a rebuilding year, and one plagued by injuries. Defense was still the main spark for the team, resulting in another win over St. Mary’s. 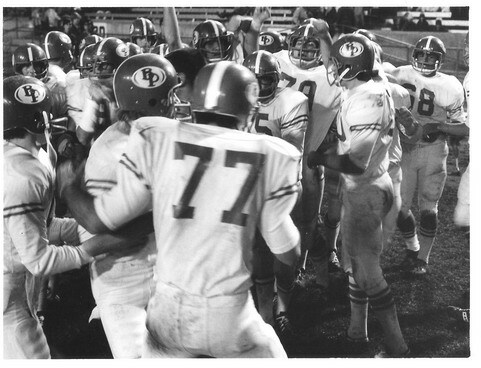 Alex “The Byzantine Bomber” Poulos was named All-State Defensive Back for 1979. The decade would end as it began, with Broncos Defense. Many loyal to Brophy football felt that the 80’s would bring the same defensive dominance that had occurred during the 70’s. Under the guidance of defense minded Coach Stinson, how could the Broncos go wrong? It was a “no brainer” as Coach Stinson was fond of saying, unless that defensive prowess was called to coach somewhere else. Coach Stinson, while continuing his teaching career at Brophy, took a coaching position at Phoenix College after the 1980 season, ending an outstanding era in Brophy Football history. They say that history repeats itself, and for Brophy that occurred during the ‘80’s. In the decade of the 60’s the football program had four head coaches in ten years, the ‘80’s would mimic that with coaches Trevor Stinson, Mickey Ryan, Fred Campisano, and Tim Sanford. Each of these coaches, while obviously having different coaching styles, had one thing in common: they all turned scrappy young boys into fine men by the time they graduated from Brophy. The second game of the first season under Coach Ryan would be one to remember. Coming off of a disappointing season the year before, the Broncos were thirsting for a chance to redeem themselves. The game was slated against defending state champs the McClintock Chargers and Karl Kieffer. Most considered this game an easy victory for McClintock, however the 1981 Broncos had other plans. “The harder you work, the more you’ll appreciate your success” were inspiring words of Coach Ryan prior to the gridiron battle. With the words fresh in their minds, the Broncos, and their “Hack Pack” defense upset the heavily favored Chargers. The season continued with a tough Skyline League A schedule and ended with a three way tie for first place between Brophy, Greenway and Washington. The last time this occurred, back in 1964, the Broncos were eliminated from post season play by a coin flip. By this time AIA had incorporated the “Colorado Playoff” method to determine who would represent Skyline League A in the post season. Brophy won this time around, only to be eliminated in the Skyline Division Championship game by the Moon Valley Rockets. The remainder of Coach Ryan’s reign was up and down. There was plenty of talent in those teams, but the scores were not in favor of the Broncos. At the end of one game during Coach Ryan’s last season as head coach, 1983, the victory over the Sunnyslope Vikings resulted in the Brophy Student Body attempting to tear down the goalposts at Sunnyslope High School. The Broncos had just broken a four game losing streak and the reaction of the fans showed their spirit as well as the pent up frustration that they had been feeling. Coach Ryan may not have won a state championship, but his spirit and support of Brophy Football, through thick and thin, was contagious. Fred Campisano became the interim coach after Coach Ryan stepped down before the start of the 1984 season. The 1984 season would be Coach Campisano’s only season as leader of the Broncos, a season that showed the players, “The Other Way Of Winning”. If the goal for the 1984 season was to learn about ourselves, our potential, and have fun playing a highly competitive sport, then the season was every bit as meaningful as a winning season. After an extensive search was conducted by Brophy, Tim Sanford was chosen to be the next leader. Coach Sanford, who holds the best winning percentage since the school reopened in 1952, was a player on the 1967 and 1968 state champion St. Mary’s teams. He previously served as an assistant under Earl “Tiny” Putman at Moon Valley. Teams under Coach Sanford in the 1980’s produced the first post season win since 1978, the first back-to-back post season appearance since 1972, and a remarkable number Sanford players who are current Brophy assistant football coaches. Sanford’s first year, the 1985 season, started off with a 3-0 mark. Game four was the game of the year. This game would find Sanford coaching not only against his alma mater, but also one of his former St. Mary’s teammates, Pat Farrell. The game was an all out war, one that left the Broncos physically and emotionally spent. The team finished 5-5 for the year, but Sanford proved that there was still life left in the Broncos. By 1987 the Broncos were back in the post season and recorded their first post season win since 1978. The first round saw the Broncos upset the number one ranked Maryvale Panthers. They lost to the eventual state champion Dobson Mustangs, but the taste of the post season would linger. The following season, with the return of Coach Stinson as the new Defensive Coordinator, the Broncos were back and ready for post season play. This was the first time the Broncos had made it to back-to-back post seasons since 1972. The Westwood Warriors, eventual state champs for the 1988 season, was the team the Broncos met and lost to in the first round. Another three-way tie for first place in the Skyline Region at the end of the 1989 season between Brophy, Shadow Mountain, and Apollo resulted in a “mini” playoff to determine who would go to post season play that year. Apollo earned a bye in this new way to determine the region champ. Brophy defeated Shadow Mountain and then lost to Apollo, ending a chance at three consecutive post season appearances and finalizing Bronco Football for the decade of the ’80 as well. The roller coaster ride of the ’80's did have its share of disappointments. It also had its fair share of excitement that included intense Bronco Spirit. It saw the return of a coach (Stinson) and the beginning of a new coaching legacy (Sanford). Numerous players from the teams of the 1980’s have returned over the years to coach for their alma mater. Former players like Mike Welty '83, Tom Kohrs ’85, Joe Klein ’86, Scott Middlemist '87, and Jose Mendoza ’88 are still coaching at Brophy today. This goes to show the impact that the coaches of the 1980’s had in the formation of these individuals. Coach Sanford sums this up saying, “The true measure of our success is not the won-loss record, but what the players have learned about themselves.” It is obvious that the players of the 1980’s have learned what it means to be “Men for Others”. The beginning of the 90’s held excitement and optimism for Bronco fans. The 1990 season saw the return of two key players from the pervious year. Both of these players would have an impact on the 1990 season, but one of them still has a lasting impact on almost all Brophy football records as well as numerous football records for the state of Arizona. The two players were senior Tony Caperalla and sophomore phenomenon Mike Mitchell (Stanford and San Francisco 49ers). The Bronco fans were not disappointed with this tandem in the backfield. The wing-T offense of Coach Sanford was designed for a powerful full back and quick running back. Caperalla and Mitchell definitely fit the mold. The offense was a major force that season and allowed the Broncos to return to post season play, only to lose in the first round to Tuscon Amphitheater. According to Mitchell the Broncos were “an equal opportunity offense. Our line just kills everyone, and that gives Tony and I room to run.” Mitchell was rewarded that season with a first team All State running back selection. Could things get better for the ’91 season? With Mitchell returning at tailback the season looked to be another memorable one. In 1991 the Broncos again made it to post season play. This year they were determined not to be bounced out in the first round. The offensive line was another good one and had Shawn Swayda (ASU and Chicago Bears) as the driving force. Mitchell was able to rack up rushing yards and touchdowns, leading the Broncos into the playoffs with much determination. The team was victorious in the 1st round over a tough Westwood squad and then another over Paradise Valley. The Broncos found themselves in the semi-finals again for the first time since the 1978 Pygmy Power took them there. They faced the Lancers of Salpointe in a game that some say sparked a new Catholic school rivalry in the state. The game did not end the way the Broncos would have liked; however, respect was gained in what the Broncos had accomplished. Coach Sanford was named Coach of the Year; Mitchell was name Co-player of the Year (as a junior) and repeated as a first team all state running back. The Arizona Republic even coined a nick-name for Mitchell, “the missile”. On top of that Swayda was also named first team All State offensive line. The Broncos were for real and their running game was a major reason. The ’92 season was mostly a repeat during the regular season with yet another loss to St. Mary’s. The team under the fleet footed Mitchell made it to the quarter-finals where a very determined Westwood team avenged their pervious year’s loss. With the end of this season also came the end of an era: the Mitchell years. Throughout his varsity career Mitchell stacked up some numbers that are still hard to believe and remain a part of state football history. In addition to repeating as both first team all state running back and player of the year, Mitchell also became the all time big school leading rusher with a career total of 5,658 yards. He tied for the most career touchdowns at 76, he had the single season rushing record of 2,190 yards, and in 6 post season appearance he accumulated 1,331 yards rushing. This was truly an amazing feat for another amazing Bronco season. Now that Mitchell had graduated many were skeptical about the future of Bronco football. “Before it was how many ways and how many different places can we give Mike Mitchell the ball. Now it will be how many different people can we give the ball to.” The words, spoken by coach Sanford at the beginning of the ’93 season, summed up what everybody wanted answered. Platoon football in the backfield allowed the Broncos to scrape their way into the playoffs where they beat Trevor Browne in the first round only to lose to Mt. View in the second. The post season was becoming the norm for the Broncos but Mt. View was to become their nightmare. The following season the Broncos meet the Toros again in the playoff, and again the east valley school gave the Broncos an early exit. The start of the 1995 season saw the realignment of the regions on the 5A level. Brophy was now a part of the Desert Valley Region and would be playing against the likes of Shadow Mountain, St. Mary’s and Horizon. They say that the tougher the region the better the competition and this held true. Even though the Broncos failed to beat the Knights this season they managed to win the region and maintain their streak of post season appearances. This year’s playoffs mimicked the last, with the exception of losing to the other powerful east valley school at the time, the Mesa Jackrabbits. In 1996 the tides changed. The Bronco squad was dominant on both offense and defense and the showdown with the Knights would be a memorable one. “SO IT ENDS” could not explain the emotions that many a fan was feeling the night of November 1, 1996. The 24 – 0 score ended the 16 year win streak of the Knights over the Broncos. The game was surreal for many, but the joy of seeing Hoy field awash in a sea of red at the end of the game will forever be embedded in the minds of many Bronco fans old and young alike. The season did not end there. The Broncos continued into the playoffs beating Mt. Pointe and Tuscon Amphitheater. They had returned to the state finals, a place that had not been since the 1972 season. The team was dominated by defense, including 5A player of the year Bryan Kula, who was also first team all state defensive line. It looked to be “the year”, except that nobody told the Toros of Mt. View. The Broncos took home the runner-up trophy and the nightmare with Mt. View continued. Defeating the Knights was becoming a new tradition with a second win in as many years in the ’97 season. The Broncos went on to defeat Desert Mt. in the first round of the 5A state playoffs only to lose again to those dreaded Toros who would go on to repeat as the 5A state champions and continue their undefeated streak from the previous season, as well as their unblemished record against the Broncos. In 1998 the team was picked to finish third, maybe second in the tough Desert Valley Region. With Horizon and St. Mary’s as a part of region play it was good that power points were used to allow deserving team to reach the playoffs. The Broncos were determined to continue their own streak of playoff appearance, one that was almost ten years old. They cruised through the first two rounds and were headed for the semi-finals, only to be on the same side of the playoff bracket with Mt. View, who were on a 40 game undefeated streak. Two of those Toro 40 wins had bumped the Broncos out the playoffs the last two seasons. In one of the toughest fought games in Bronco playoff history, Brophy defeated the highly favored Toros by a score of 10 – 3. Numerous players and fans walked away from the game emotionally drained. The nightmare was over, but the coveted state championship game still awaited the Broncos. In a shootout versus Desert Vista, the Broncos came up short, but the game was touted as one of the most exciting and it holds a state record for the most combined points scored in a 5A state championship game. The ’98 team could attribute their success to two all state players. Pat Walsh (ASU) was named first team all state center and Brian Gaffney (Stanford) was named first team all state linebacker. The last season of the ‘90’s was a bit of a let down compared to the dominance of the previous few years. The Bronco team lacked experience with only one returning starter that season, but there were some shining moments. Two games were memorable that year because both were won in double overtime. The Broncos handed Mesa and Paradise Valley losses in this manner, but it showed the fans that the Broncos would never quit. At the end of the 1999 season the Broncos had a showdown with the Knights during the last game of regular season play. The winner would move on to the playoffs; the loser ending their season. The Broncos gave it their all but post season was not to be. The dynasty of Coach Sanford in the ‘90’s strengthened the spirit of Bronco football. As the world awaited the arrival of Y2K, the Broncos were preparing for the next decade and next millennium. What new challenges would there be? With the stigma of the Knights no longer looming and the nightmare of the Toros vanquished, the Broncos had one shared vision, a state championship. The new millennium would see the continuation of the Sanford Dynasty. Sanford’s wing-T style offense, coupled with the balance of a stingy and fast 5-2 defense, allowed post-season play to become the norm for Bronco football. The 2000 Varsity football team had a plethora of returning seniors complemented by talented juniors and the occasional sophomore. The senior heavy offensive line was touted as very aggressive, since 3 of the starting 6 also played on the defensive side of the ball. Numerous other broncos would end up playing “iron man” football for the Broncos this season. Tight End/Defensive End Larry Rosky ’01, stated that “the game is going to be a lot different.” He was joined by two way starters Mike Robson ’01 (Offensive Guard/Linebacker), James Robinson ’01 (Offensive Tackle/Defensive Line), Steve Gamage ’02 (Full Back/Defensive Line), Tim Hall ’01 (Tail Back/Defensive Back). Defensive Back extraordinaire Johnny Riebel ’01 would lead the team in interceptions with 5, and make it into the Bronco record book with 11 career varsity interceptions. On the offensive side of the ball the Broncos had two alternating quarterbacks in Jared Chase ’01 and Jeff Rush ‘02, as well as Matt Dalton ’01 who earned 28 receptions for 625 yards for the season, including nine for touchdowns, and had 864 career receiving yards in two varsity seasons for the Broncos. Newcomer to the offensive side of the ball was senior Basil Etefia ’01. Basil was an unknown as a ball carrier and had spent his previous years as a defensive back. His speed is what caught the eye of Coach Sanford and this change for Basil was a plus for the team. With all of this talent the Broncos paved the way to a 9-1 record in the regular season, including a comprehensive team shutout of St. Mary’s 21-0. The victory assured the Broncos a Desert Valley Region title and a trip to the playoffs. The post season first round touted the Broncos against the Pride of Mountain Pointe but the game was a lopsided victory for the Broncos 42-15. The quarter final game was host to Red Mountain, an East Valley team who was slowly beginning to make wave in 5A football. The game started slow, with defense dominating. Rushing yards were impossible to come by for either side so an offensive air strategy soon became something that both coaches looked to. In the end the Lions of Red Mountain had a more effective passing attack that ended the Broncos season 16-30. The 2001 season had many similarities to the 2000 season in that there were many returning players, including Jeff Rush ’02 at the offensive helm. Jeff had shared the position last season yet his combined varsity seasons at quarterback would lift him to the top of the all time leading passer in Brophy Football history at 3,384 yards. In addition to Jeff, the offensive backfield had speed and talent in Adam Deguire ’02 and Brian Kelly ’02. Brian was also a return specialist for the Broncos and etched his name in the record books with two kickoff returns for touchdowns. He had a 97 yard return in the season opener against Salpointe and a 99 yards return against Desert Mountain. Steven Gammage ’02 added the muscle to the already speedy backfield. Taber LeMarr ’03, in his only season at receiver since he was the back-up quarterback, led the Broncos with 52 receptions for the season, including 7 for touchdowns, rounded out a powerful offense. Defensively the Broncos were not as strong due to the void left by numerous seniors, however the talent that was discovered allowed for the Broncos to end the regular season with a 6-4 record. The battle for dominance in the Desert Valley Region was hard fought and the Broncos ended up in second place due to a hard fought loss to region rival Horizon. The loss was only a temporary setback since the Knights were slated as the final game of the regular season. The stampede that ensued was not a pretty one for St. Mary’s. The 21-7 victory marked the second consecutive win against the Knights, and the fourth win over the past six years. The drought was surely over. For the first round of the 2001 post season the Broncos had to travel to Tuscon to play the Panthers of Amphitheatre. The game ended in a 28-18 win for Brophy. The second round witnessed a repeat of last year’s quarter finals with the same outcome for Brophy. The game was close early on, but turnovers led to a 14-27 loss to Red Mountain. Even though the Broncos only had very few returning starters, the 2002 season was supposed to be a promising one with a preseason ranking at #7. The team suffered a major setback with the serious injury of then junior Alex Ganchev ’04. Alex was paralyzed and in a coma from a car accident that occurred the night before the team was scheduled to leave for their annual retreat. The emotional strain that this had on the team could have been one of the reasons that the Broncos started the season 0-5. Instead of allowing these five loses to deflate the team, they rallied to win their next four in a row and put themselves into contention for the region title. The final game of the regular season for the Broncos the last few years had been played against long time rival St. Mary’s. This year would be no different. The game was hard fought, but in the end the Broncos missed out on what would have been a remarkable region title. Longtime Coach Tim Sanford was replaced after a eighteen years at the helm by Coach Jeff Kearin for the 2003 season. Kearin, a graduate of Loyola High School in Los Angles, came to Brophy with an established coaching career that included a start under Coach John Robinson of USC. Along with Kearin came new Defensive Coordinator Mark Nolan. Kearin and Nolan immediately immersed the players into both a new offense and defense. During spring practice of 2003 the new age of Bronco football was unleashed. This style of football introduced the varsity players to “Hell Week”. A time of multiple practices each day coupled with living in the gym for a week with their teammates. At the end of that week the team became a cohesive unit that was ready to face any opponent. To help with the numerous changes players had to overcome Kearin increased his football staff on all levels. The additional coaches would be a vital part to the success of his program. The college experience that Kearin brought with him included the philosophy of “platoon” football. This meant that players were limited to playing either offense or defense. Few exceptions were made. This new style of football, for Brophy, allowed for players to obtain more practice time in their area of specialization. With the preseason practices behind them the team, the coaches and the Brophy Community were ready to see the Broncos play. A final change to the start of the Kearin era was a new look for the team. New uniforms (that included red pants for away games), a fresh, tougher looking bronco (which would become the official logo for all athletics in 2004), and new helmet decals (that incorporated a white stripe down the middles of the helmet with the Brophy crest on the sides) presented the new age of Bronco Football. The 2003 season witnessed the Broncos start off on the wrong foot with a 0-27 loss to Mountain Ridge. Many questioned whether the sophisticated offense and new defense would be too much for the players to manage. This began to change when the team realized that the high-powered offense could score points quickly, due mainly in part to the complex passing game supported by a stretch running game. The team struggled at times defensively, but the stingy, never give up attitude kept them in numerous games. The team qualified for the post season but had to travel south in the first round to play against our other in-state Catholic school rival, Tuscon Salpointe. The Lancers ended the Bronco season 14-42. A highlight for the season was a 38-17 slaughter of St. Mary’s. With a year of the new style of football under their belt, many saw great things ahead for Kearin and the Broncos in 2004. Numerous returning lettermen fueled the Bronco Machine. The running game was dominated by Markel Devorce ’04 who would rush for 2,127 yards and score 202 points in one season at tailback. The previous season he played only defense, so many teams were stunned at his ability to carry the ball so well. With the running game a constant threat, the passing game began to open up as well. Sophomore quarterback Connor Hearn passed for 1,729 yards, while junior wide-outs Matt Smith ‘06 and Mike Gianolla ’06 both had over 300 yards receiving. This resulted in numerous high scoring games, including a 62-7 uncrowning of the Kofa Kings, a 56-17 non-region stampede over the Camelback Spartans, and a 55-20 first-round de-clawing of the Maryvale Panthers. The team also made it two in a row over the Knights with a 17-16 nail-biter. Could this be the year? Many loyal Bronco fans were well prepared for the Broncos to reappear at ASU for the state finals. After the easy win over Maryvale, the Broncos had to face their new east valley nemesis, the Red Mountain Lions, in the second round. The Lions were responsible for knocking the Broncos out of the playoff in both 2000 and 2001. This time the result was disastrous for the supposed king of beasts. Brophy cruised to a 24-0 victory and were poised to face another feline foe, the Mountain Ridge Mountain Lions, in the quarterfinals. “Ridge”, as they like to be called, had a former St. Mary’s graduate as their head coach, and had lost their season opener to the Broncos. They were poised for revenge and obtained their wish in an offensive shootout 34-42. The dejected Broncos vowed to return to the post season, while the fans were anxious to see what 2005 would hold, especially since there would be nine returning offensive starters and three returning defensive starters. The Kearin style of football was now a well oiled machine that was making waves in the 5A football pool of Arizona. What would the 2005 season bring for Brophy and its new style of play? A change at the helm was not something that anyone had anticipated. In January of 2005 coach Jeff Kearin decided to return to his alma mater, Loyola High School in Los Angles, to begin his “dream job” as head football coach of the Cubs. The Brophy community was grateful for his two years of leadership and fresh direction of the program, but who would be his replacement? Numerous people applied for the position, and when the dust cleared it was decided that the current quarterback coach, Andrew “Scooter” Molander would take over. A new coach usually means a whole new coaching philosophy and scheme, however, since Molander was an assistant under Kearin, and the defensive coordinator, Mark Nolan, had decided to stay on, limited changes to the playbook was necessary. After all, why change a good thing. Molander’s “team” view of everything, including his coaching staff on all levels of the program, was the missing link that the Brophy football program needed to make history. 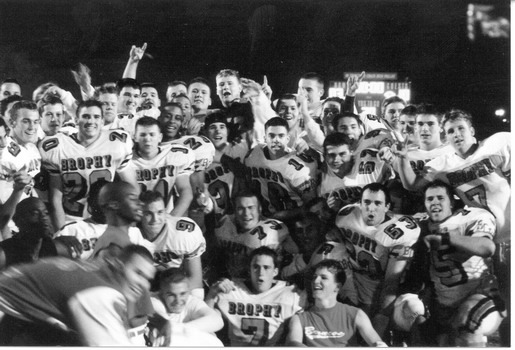 A storied season would exemplify 2005 for Brophy Football. Many outside the Brophy Community have referred to it as a Cinderella Season, but loyal Bronco Fans will always call it a season to remember. AMDG Ad Majorem Dei Gloriam "For the Greater Glory of God"